MARRAKECH — In 2016 Alia Ali began work on a photograph series titled BORDERLAND (2017–ongoing), using fabrics to explore regions where different cultures and histories overlap. 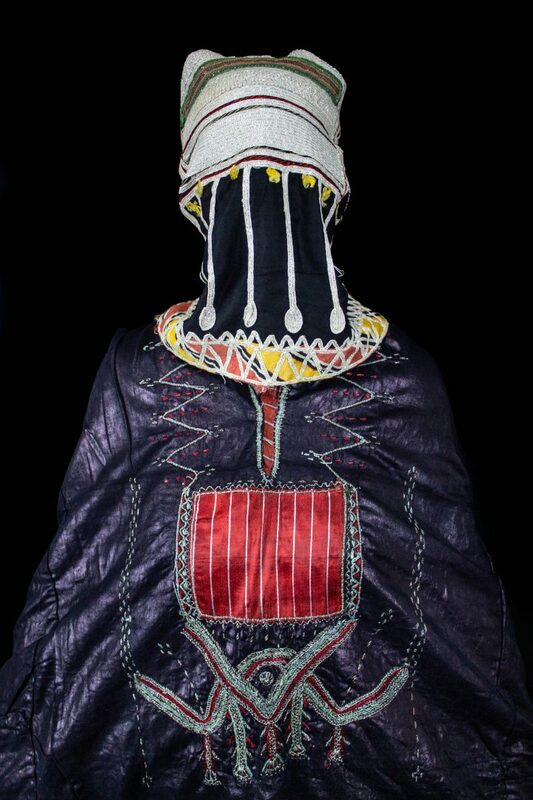 The series consists of textile masters wrapped in their own fabrics. Their whole bodies — including their faces — are covered, thus expressing their cultural identities through their craftsmanship. To create BORDERLAND, Ali travelled across 11 regions of the world. She communicated with textile artists who live in communities whose borders have been marked “by imprints of power and scars of destruction,” creating connections across cultures that dismantle physical, political, and historical borders. Her images have previously been shown across Europe, the Middle East, and the United States, but until now, the photographs focusing on Yemen — Ali’s native land — have never been exhibited. At a time that can only be described as a crisis in Yemen, Ali is exhibiting a much starker body of work, titled UNDER THREAD (2019), alongside the colorful BORDERLAND series. The former questions the political implications of the West’s presence in Yemen. Ali spoke with Hyperallergic about fabric, photography, politics, and her art. Lizzy Vartanian Collier: Tell us a bit about the two series, BORDERLAND and UNDER THREAD, that are currently on exhibit in Marrakech. Alia Ali: Textile has always been significant to my work — it’s significant to us all. We are born into it, we sleep in it, we eat on it, we define ourselves by it, we shield ourselves with it, and, eventually, we die in it. It somehow unifies all of us, and yet it physically and symbolically divides us. This paradoxical relationship interests me, and it exists in the most familiar things that surround us. I approach both these bodies of work through textile, thread, and photography, all of which can be used as tools and weapons, forms of expression and means of threat. The Yemenis from the BORDERLAND series are, in fact, the first images I photographed for the series. My mother collected an impressive collection of Yemeni traditional dresses from all parts of the country and this is where I started from. I haven’t released these photographs yet because my intention was to photograph them in the location they were made, as I did with the rest of the series. But with the war raging on — it will be four years this month — there is an urgency in releasing them now. My Yemeni grandmother communicated through her textiles, namely embroidery, dyeing, and weaving. They are a form of documenting stories and occurrences, be they tribal, historical, religious, cosmic, and/or mythical. We have an oral history that was not written by us, but by our British colonizers. So the damage was immediately done as it was put on paper in a language that wasn’t ours by people who weren’t us. Our stories were never written on our terms, and to me these dresses and textiles are documents of how we see our culture, our heritage, and ourselves. In the Yemen series, specifically, I’m reclaiming this stance by looking at Yemen through its beauty rather than its suffering. It is only through this lens that we can know what is at stake during the systematic erasure of Yemeni communities and heritage, which is not only being wounded but [is] permanently scarred by imprints of power and destruction. LVC: What inspired the shift of material from fabric to thread in UNDER THREAD? AA: In Islam, it is believed that Prophet Mohammed is escaping from people who were trying to capture him. An angel tells him to rest in a cave, where he is concerned with being trapped, but the angel insists [he goes in the cave]. Meanwhile, a spider weaves a web across the entrance of the cave, and those who are trying to capture him realize that it would have been impossible for him to be in the cave, otherwise the web would have been broken — alas, the Prophet was protected. Muslims are never to kill a spider as they are considered to be baraka, a blessing. Something so small produces something so seemingly fragile and incredibly resilient. In these photographs I think of how thread can protect us but also harm us. Very much like government: it protects us, but it can also suffocate and stifle us. I combine thread and photography into an installation addressing paradoxical notions surrounding conflict and peace, active participation and passive absenteeism, hopefulness and despair, complicity and ignorance, government involvement and individual participation. LVC: Was it a conscious decision to show these two contrasting Yemeni series now? AA: UNDER THREAD is an interrogative series, unlike BORDERLAND, where I approach it as a citizen of my native land, Yemen. I approach UNDER THREAD as a citizen of my adopted land, the United States. I interrogate the audience by asking who is responsible for the wars that we, as a nation, participate in. Is it the government, its citizens, or government-backed companies? The US is a republic where elected officials decide what is to be done with the capital of their citizens, and in many cases, companies place those officials in their seats and dictate those decisions. Conflict is certainly more profitable than peace and the United States has almost constantly been engaged in the perpetual business of war. So, if engagement of war has not changed, then what has changed in the last 50 years to make individuals ambivalent about their country’s involvement in conflicts abroad? Is it the censorship of the media, the over-saturation of information, or the progressive implementation of fear? The limited and speculative layers of (mis)information, both at home and abroad, are overwhelming, painful to believe, and complicated to process. UNDER THREAD rips the web of conflicting tribal, national, and colonial histories with regard Yemen, and focuses directly on the importance of what is at the core of it all, humanity. LVC: It’s interesting that BORDERLAND is so vibrant, and UNDER THREAD is drained of color. AA: When I think about culture, I think of a tapestry, carefully woven, dyed, prepared and, in some cases, mended. Indeed, BORDERLAND is an eruption of color, texture, and, most importantly, intrigue. Who is on the other side of these textiles? What hands and minds produced such exquisite fabrics? What happens when that tapestry is ripped apart? UNDER THREAD is more about distinguishing misinformation from information, illusion from reality, facts from lies. There’s an ambiguous space between being entirely wrapped and unravelled. Perhaps the truth is never possible, but it is for us to be conscious of the extremes and push them. The tipping point of what made me reveal the work was the school bus airstrike that took place on August 9, 2018, in Dhayhan, Yemen. An improperly targeted Lockheed Martin missile, used by the Saudi Coalition, claimed the lives of over 40 school children on a school field trip in the northern part of Yemen. In this long war, everyone is complicit, including the Saudi-led Coalition and the Iran-backed Houthis. War is war and lives will be claimed, but when collateral damage becomes frequent we must hold those responsible, accountable. If the killing of several dozen children doesn’t drain all the color out of us, I can’t imagine what will. LVC: What are you hoping people will take away from UNDER THREAD? AA: In the wake of the four-year war in Yemen, the US, among several other nations around the world, profit from what is considered to be today’s worst humanitarian crisis. I’d like people to not only question what is causing the war, but rather who is causing it? Who is profiting and how? While the war abroad is one of violence imposed on others, the war at home is one of augmenting figurative and literal walls that continue to systematically threaten our sense of agency and degrade our individual power, diminish our voice and deplete our concern for others, therefore shifting our long-held identity as “caretakers” to one of “warmakers.” So, again, it’s not what is causing these walls, but who? I think it comes to no surprise that the answer to both [questions] is the same. BORDERLAND and UNDER THREAD by Alia Ali are presented by Galerie Sinya28 as part of the 1:54 Contemporary African Art Fair at El Fenn, Marrakech through May 30. The work will also be exhibited as part of On Echoes of Invisible Heart, curated by Lila Nazemian, at Station Beirut (Secteur 66, Rue 90, Jisr El Wati, Beirut, Lebanon) opening April 17.